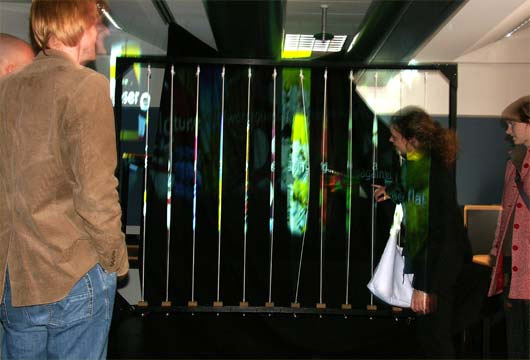 The Logtime twister is an interactive installation that was designed for the Microsoft Design contest 2005. 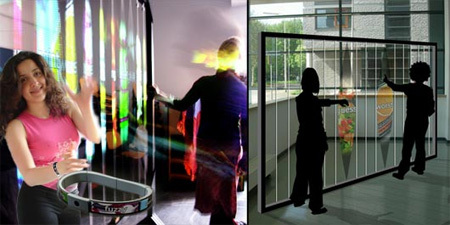 Logtime twister is a concept that consists of two seperate products: a bracelet and a projection installation. The concept is developed to let people (for a moment) escape from reality by providing them with dreamy, poetic encounters during their day. The Twister (LED string construction) and the Logtimer (bracelet) let you re-experience your day in a poetic way. The Logtimer captures photos and sound clips during your day. The Twister makes it possible to re-live the captured moments in a playful way. By pulling a string on the Twister a projection of an image and word is projected on the string. By playing the whole spectrum of strings users can create visual poems with words and images from their day. The poem can be stored on the bracelet where it is visible for one day.The Twister, the device that lets you play with moments from your day, was built and could be experienced by people at an exposition. The LED strings were simulated by projecting clips on vibrating elastic strings. Special sensors were developed to sense vibration in the string.This project received a honorable mention at the Microsoft Research design competition and was exhibited at ‘Design in Delft 2005’.